Many businesses and organizations have a vision to be green. Every business needs to stay out of the red and in the black. Meanwhile, a number of businesses are torn because they associate being green with being in the red, and that environmental initiatives come with unavoidable costs. The simple truth is that businesses don’t need to pick one objective over the other. At The Refinishing Touch we know that environmental sustainability and financial sustainability are both sides of the same coin. In other words, being green goes hand-in-hand with being in the black. Assets are valuable, not merely as functional objects but for operational efficiency: Furniture asset management, whether it is refinishing, reupholstery or remanufacturing, preserves furniture as a long-term asset that benefits the balance sheet. Compare this to replacing worn furniture with cheaply made substitutes which requires sizeable capital expenditure – and repetition over a disappointingly short cycle. Refinished solid wood pieces are more durable and require less maintenance than new pieces. Poorly-made furniture of veneers and composites will not last a decade, and replacements will have to be budgeted for again in one-third of the time. Over almost four decades we have helped more than 22,000 organizations and businesses to deliver rapid returns on investment while improving property at savings of up to 80% over replacement furniture assets. Reducing costs through sustainable asset management improves efficiency, increases profitability and mitigates operational risk. That’s the true bottom line. The positive environmental impact is demonstrable, but the financial benefits are significant, measurable and repeatable. Please email us today to discuss the financial and business benefits that furniture asset management could deliver for your business. As the first quarter of the new year comes to a close, we’re pleased to announce the new edition of our quarterly newsletter, InTouch. If you’re a subscriber to our newsletters you will know that InTouch is our opportunity to share our progress and that of our customers and communities. We update our readers on the latest news of our current and ongoing projects; industry events; share viewpoints on the refinishing industry, and engage with our inspirational customers, business partners, associates and other members of the education, hospitality and government communities. In the most recent edition of InTouch, you can read stories about our ongoing work at the Naval Air Station, Pensacola; our insight into universities around the nation embracing sustainability; tips on how to make furniture asset management work for your organization; and a look into a one-of-a-kind remanufacturing project at Seattle’s Hotel FIVE. Also, we extend a special invite to all of our readers and customers to our upcoming Hotel Interactive webinar, ‘How to avoid letting PIPs bust your bottom line’, on May 1st . We hope that you enjoy this edition of InTouch! And remember, you can sign up for our quarterly newsletter by filling out the subscription form at the bottom of our homepage. As always, thanks for reading, and don’t forget to say InTouch! Here at The Refinishing Touch we consider ourselves as pioneers within the growing sustainability movement, particular amongst our target industries—government, higher education and hospitality. Having been in the business for 35 years, we continue to work to ensure that refinishing, refurbishing and reupholstery helps our customers save money and the environment, versus buying new furniture. In this month’s visual blog post, we wanted to highlight the work that we’ve done at a number of universities across the country, and show the benefits that an entire industry has seen from furniture refinishing and furniture asset management. Universities are one of the top industries in the world whose furniture assets experience constant and consistent wear and abuse. As you can see from some of the photos below, most of this furniture may have looked as if it was time to be thrown away, but all it needed was a bit of tender love and care! 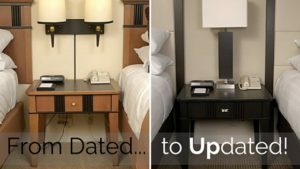 The fact that these institutions are willing to embrace the notion of refurbishing and refinishing their existing pieces is not only cost effective but also very smart. See for yourself how something as simple as reupholstering and refurbishing can take a furniture piece from outdated to updated, all while reducing carbon footprints one customer at a time. The Refinishing Touch is pleased to announce its most recent article about the benefits of refurbishing and asset management has appeared in the newest edition of American School and University. The Refinishing Touch has worked with over twenty schools around the U.S., and many institutions have experienced the environmental and fiscal advantages of reusing furniture instead of buying new pieces. Tight budgets and pressure to increase sustainability are two driving factors for schools when choosing between refinishing and buying new. As assets under regular use begin to age, schools must weigh their options. When it comes time to replace those assets, it is important for schools to consider all of the option and to understand the many benefits of refurbishing and refinishing. Not only does refinishing save money, but it also saves the environment. The Refinishing Touch provides schools with a simple way to use what they already own, save money, and move towards the goal of sustainability. To read the entire article, go to the story or pick up the newest edition of AS&U on newsstands now.